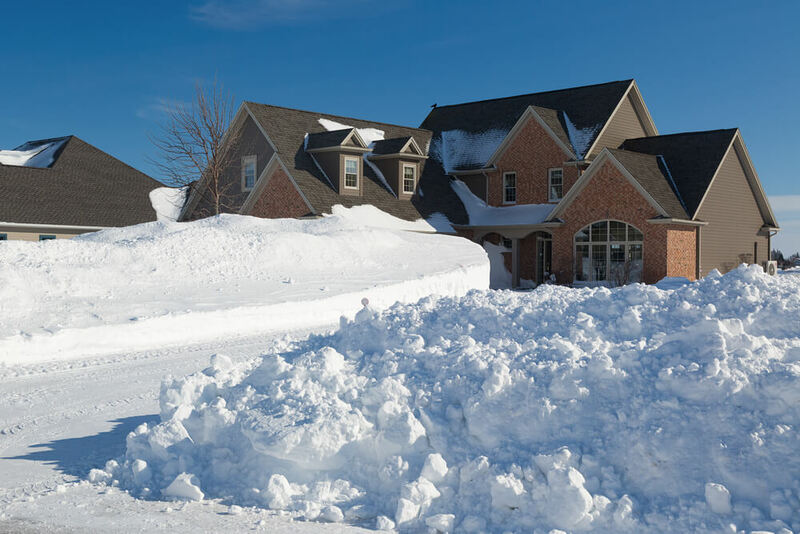 According to the Insurance Information Institute, property losses caused by snow, ice and freezing temperatures come in third on the list of catastrophic losses caused by weather behind hurricanes and tornadoes. Consider these tips to avoid your property becoming an insurance statistic this winter. No matter your climate, if you get even one hard freeze a year, you need to know how to protect your pipes. The average burst pipe insurance claim is in the neighborhood of $18,000. The damage to your pipes is just the tip of the iceberg. You'll be facing replacing flooring, possibly sheet rock replacement, re-painting the room the incident occurred in, possible mold removal and prevention measures may have to be taken to maintain a healthy rental property. The costs can be exponentially more if the home is occupied and tenant property loss has to be taken into consideration. If the pipes burst in an upstairs home, there may be a who other set of problems below. The good news is that preventing this tragedy is fairly easy. Making sure your pipes are insulated is step one. Don't forget to turn the heat on in unoccupied homes to prevent any loss there. Also, before the first freeze of the year, consider sending emails regarding best practices to your tenants. You might even stop by or have a community meeting scheduled in a multi-family situation to discuss ways to prevent catastrophe. Remind them to open cabinet doors to allow the heat to reach pipes. Have them leave their faucets dripping overnight as a preventative measure. In your email or meeting regarding burst pipes, you might also mention the dangers of space heaters and whether you will allow them or not. The chilly temperatures may tempt smokers to stay inside, this is the time to reinforce any non-smoking policy among tenants. Inspections are also a good idea this time of the year. Furnaces should be inspected, cleaned, filters changed and checked for leaks. All smoke and carbon monoxide detectors should be checked and batteries replaced if necessary. If you have a wood burning stove or chimney, it should be checked for obstructions, proper venting and structural integrity. Heavy snow can mean a nightmare for a roof that was not in tip top shape to begin with. So, in preparation, your roof should be inspected yearly, preferably before the weather turns cold. Any loose shingles or tiles must be replaced and the seal around vents, skylights and other protrusions should be checked and replaced if necessary. This is the type of preventative maintenance that can save you thousands in the long run. Gutter maintenance is important for snow drainage. Walk the roof's edge making sure all gutters and downspouts are properly secured and free of debris that might inhibit drainage of melting snow. After a heavy snow, consider not only shoveling you sidewalk and driveway, but the roof as well. Not only can a heavy snow load lead to structural damage, but multiple meltings and re-freezes can turn snow into ice dams along the edge of your roof that can lead to water damage inside your walls. While your roof is on your mind, don't forget about your landscape. Trimming trees is a must. Every year we see news stories featuring people with smashed cars and roofs because of tree limbs that collapsed under heavy snow and ice load. Don't be the property manager who has to deal with that! Now is also your last minute to get that patio furniture and your outdoor decorative items that might not survive the weather safely locked away. The last and perhaps the most important topic of all you should be talking to your renters about is what to do when an emergency strikes. When the power goes out, most people go straight for the candles and other open flames. This can pose a huge fire hazard. Encourage your tenants to use battery operated flashlights and lanterns for lighting in an emergency situation. Even better, you could visit your local dollar store and put together a small, relatively low-cost emergency bag together and bring it to your tenants. Include a set of instructions on what to do in emergency situations, including a list of numbers to call. This little bit of money and effort will go a long way toward making your tenants feel like you care and it will offer you a bit of peace knowing that they have the means to carry out your emergency plan as detailed. Unfortunately, not all property damage is avoidable. However, with a little time and effort you can make your rental property a safer place and avoid many of those potential pitfalls.